Ipoh Kong Heng Restaurant – Upgraded from a coffee shop (kedai kopi) status recently, yet still fondly recognized as a downright kopitiam in the heart of Ipoh’s old town. I still remember my first visit to Kong Heng back in the 80’s. With late grandfather in tow; we would scrambled for a seat amongst the sea of people for breakfast on a Sunday morning. If you’re curious as to whether Kong Heng has changed from then and now? A resounding NO would be an affirming answer. 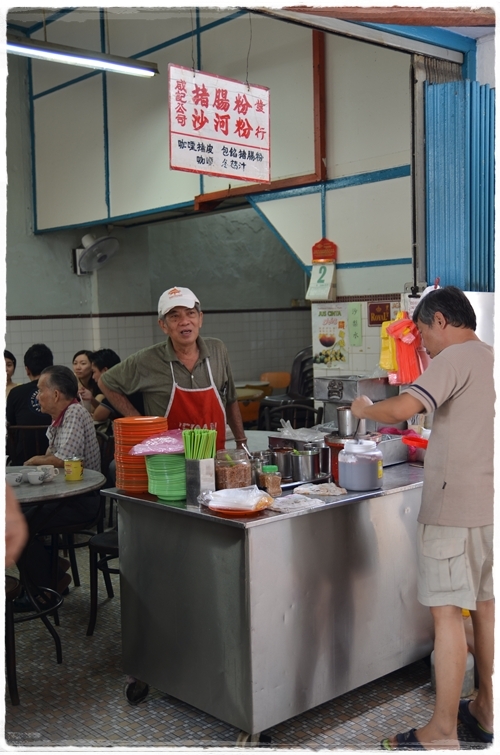 Although not as aggressive/pushy like the days of yore, some of the hawkers still swarm your table once you’re seated comfortably and recommending food items from their respective stalls before you can even give the charming kopitiam a quick 360 degrees glance. 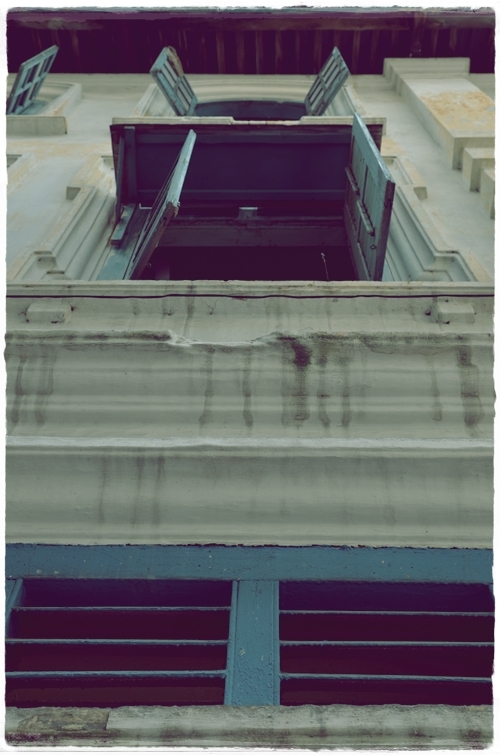 Let me take you for a stroll down memory lane, and rejoice in the fact that Ipoh is still blessed with priceless gems like this. But for how long more? 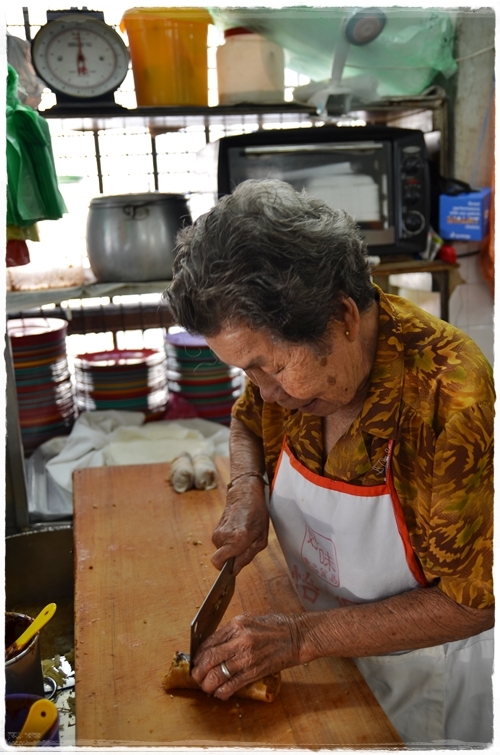 The Popiah aunty was not the same from when they first started, but she is making hers almost exactly the same way as the original one. Some of the stalls still remain until this very day. The satay stall for instance; what could possibly be the ONLY stall in Ipoh serving pork satay since the 70’s (?). The others have changed owners, some items even reworked to fit in a fanciful 90’s/noughties (2000’s) era. The beef noodles for instance, was not what I remembered from the 80’s, but I could be wrong since Mum was not an advocate for anything with beef when we were small. Not so much for religious standing, but more so because we should not eat red meat as much. And just imagine the rebellious nature taking over this corrupted soul now. But I digress. 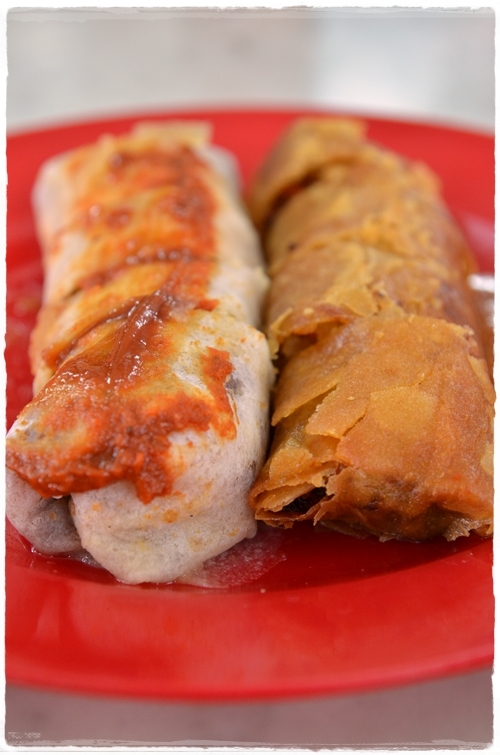 At RM1.80/USD0.60 per roll, the wet/fresh popiah (left) and the fried version (right) are equally as good, so highly recommended for you to order one of each. We were still frequent customers to the popiah (spring rolls) stall back when I was still working in old town of Ipoh. Within walking distance were all these magnificent coffee shops; rendering breakfast almost a pre-requisite to a good and productive working day ahead. I do miss the crunchy fried popiah stuffed with various julienned ingredients, then served with a dollop of chili sauce on the side. Though Mum was not impressed with the omission of the previous auntie’s signature ‘tim cheong’ (sweet sauce). The fresh one was good too; still packed with juicy fillings albeit not stuffed with crunchy fritters or crab meat like say …. the grumpy Canning Garden uncle’s version. But on a personal level (don’t judge me, taste is subjective remember? ), I prefer Kong Heng’s version for more reasons than one. Intensity over the charcoal flames. 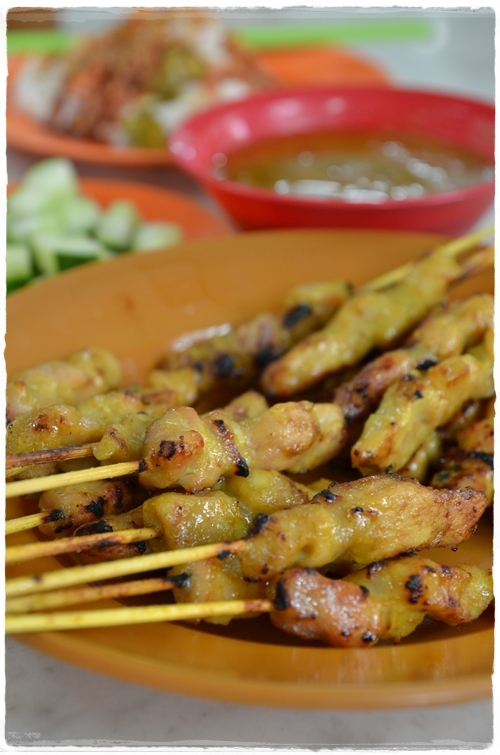 Pork and chicken satay are available for choosing, as well as their infamous offal satay. The same satay uncle was not to be seen that morning. Instead, a few unfamiliar faces were manning the stall. 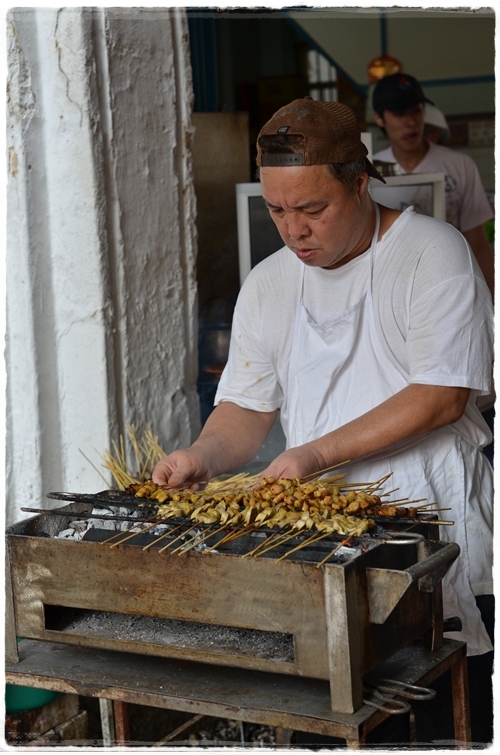 Though still unmistakably the same ‘Kong Heng’s satay’, down to the selection, the peanut sauce with a dark, brooding legacy (shall not tell unless necessary), and the eat-all-you-can concept (you only pay for what you ate, and the extras would be returned to the grill at no extra charge). Nothing much has changed since their inception; but it’s never change in the ambience, food or the culture that we should be appreciative for. The institution should not make way for development/commercialization purely because of revenues and aggressive adaptation to modern times. Instead the younger generations should be taught and trained to admire such a timeless piece of history. Succulent pieces of pork skewered and grilled with charcoal-fueled flames, with minimal burnt bits and practically NO fatty cuts of meat. The same modus operandi applies for the satay stall, rojak and wantan mee stalls. The popiah, beef noodles, chicken rice, chicken kuey teow soup and lor bak stall operators no longer participate in the ‘campaigning’ for your order. A far cry from Penang’s extensive lor bak mix, yet the fried pork spring roll wrapped in beancurd sheets; also known as Lor Bak or Ngoh Hiang is still served with their signature sweet and spicy sauce with sesame seeds. 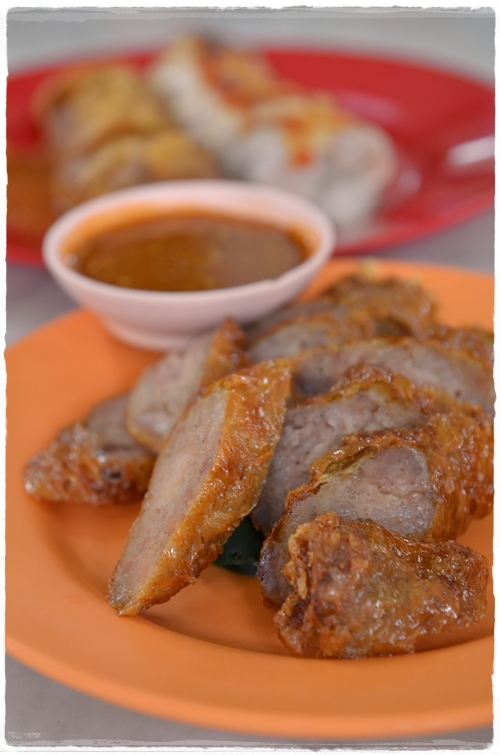 Beautifully cut pieces of Lor Bak served with their signature dipping sauce. The ‘Kai See Hor Fun’ (chicken kuey teow soup) commands a strong following too, but just a notch below Thean Chun‘s version from next door. Bear in mind that you can cross-order between these two shops; except for drinks and the chicken kuey teow soup. A pity, since if you can, then seated in Kong Heng would be a far more pleasant breakfast experience. Why? Because Thean Chun’s (also known as Hall of Mirrors) drinks are but some of the WORST in old town. Don’t go for their coffee, tea, Milo etc. But then again, Thean Chun’s caramel egg custard is the BEST that you can ever hope for in Ipoh. A catch 22 situation, really. Just so you can revisit again and again to compare between the pros and the cons of both legendary institutions. 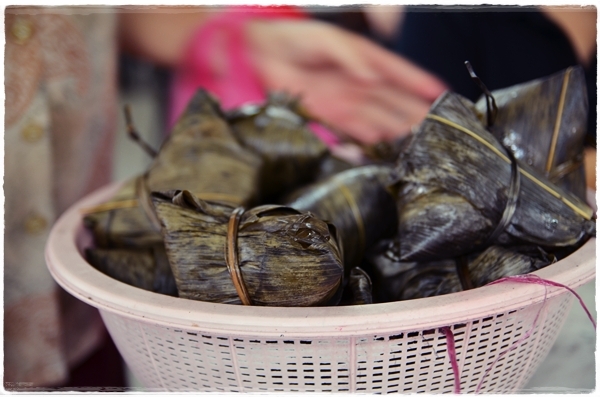 Wrapped glutinous rice with pork, beans, mushroom and salted egg yolk; also known as ‘Bak Zhang’. A staple when Dumpling Festival is around the corner. The chicken rice and beef noodles are negligible from my humble experiences. And the popiah stall sells laksa too; the famous Penang style of Assam Laksa with a pungent hint of shrimp paste and sour tinge from the tamarind slices. Me? Not a fan of assam laksa … thus, no comment. But this stall in Gunung Rapat is seemingly popular for their version of the fish-based spicy rice noodles soup. 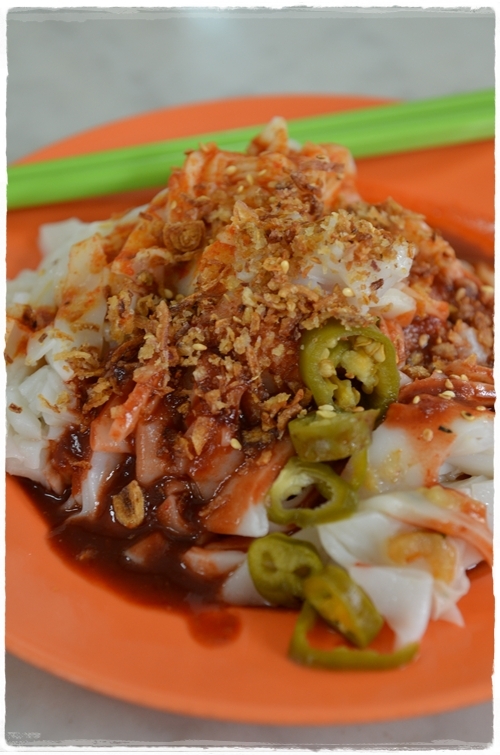 Ipoh style Chee Cheong Fun – Pick from a variety of sauces and gravy, then have a blast slurping on those slippery smooth rice noodles. And here’s how you can capitalize on the inter-changeability of orders between the shops. 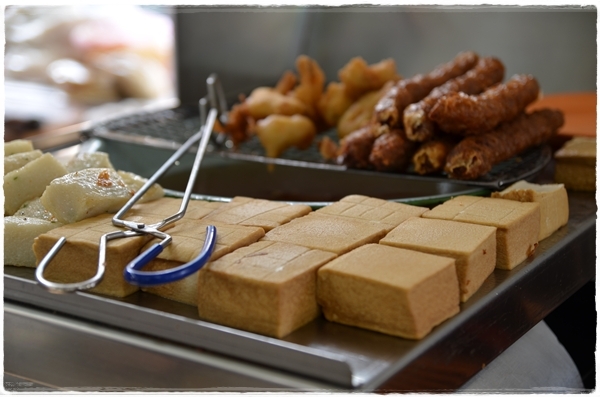 If you’re seated in Kong Heng, remember to order the satay and chee cheong fun from Thean Chun. If you’re in Thean Chun, go for the popiah and rojak from Kong Heng. That should do the trick. And to the Michaelians out there, do you know that the same uncle supplies his CCF to St.Michael’s secondary school’s canteen? Now you know. What sweet memories, when a plate went for 60 cents (not too long ago lah … about a decade or so) and we would gladly walloped a plate or two on the spot. Milk tea from Kong Heng – The sudden surge in beverage prices got us shell-shocked, almost dumb-founded. Now a cup of tea or coffee (hot) can go up to RM1.30, while the iced version can come to RM1.80. 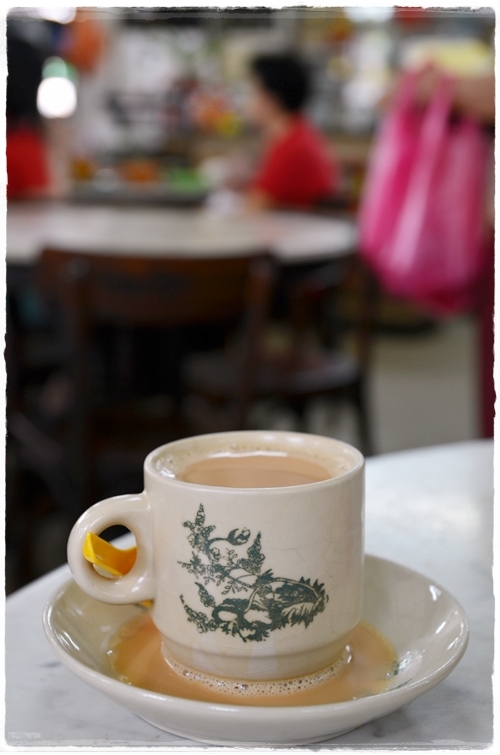 Still, if you’re in Kong Heng, go for the tea more than the white coffee. For coffee, hop over to Sin Lean Lee or Nam Chau. 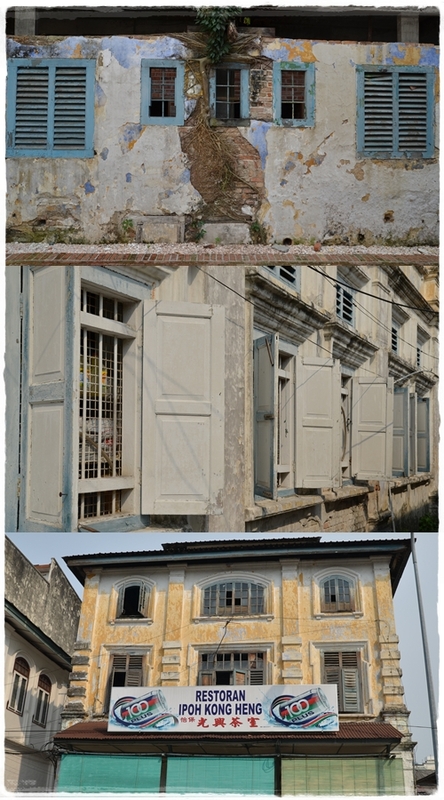 Still exuding the aura that blends in so well with old town’s heritage ambience. But not for long, it seems. Word on the street is, Kong Heng will be refurbished or relocated. A hotel might be build next to this, or on the same ground. Thus, reinventing the coffee shop seems imminent; possibly turning this into another Old Town White Coffee style of modern kopitiam. But that would be wrong. One of the many charms this place still possess since the olden times is the haunting allure of being seated and dining on the same table that your grandfather might be enjoying his cup of tea from the 70’s. The marble tables, wooden chairs, mosaic tiles and window panes all date back to the pre-modernization era. Do you see a glimmer of hope, or a flash of history wiped out by development? Today is the 9th of July 2011. At this time of writing, we are 4 hours away from a peaceful rally that might change lives and shakes the very foundation that has built this sturdy country since Independence. Do not lose hope, for I believe that if you stand strong by your beliefs, someone somewhere somehow would be listening to you. An old boy of ACS Ipoh still remembers the good old days when my dad usually took to Kong Beng for lunch. From Toronto with God’s Blessing. 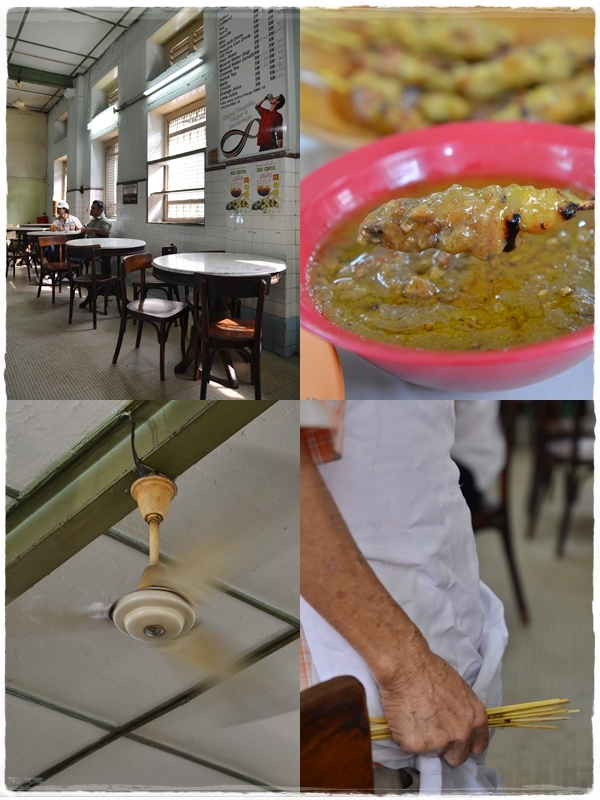 Kong Heng restaurant is my favourite visit every time I am at Ipoh. This changed one day wheny family arrived at the restaurant late at 3pm and many of the stalls were closing. The chicken rice stall owner welcome us and we ordered from him. Bad experience started when the chicken rice stall owner deliver the food and my wife questioning the price inconsistency. The chicken rice stall owner clarify the price and become agitated, started raising his voice and claimed that we unfairly accused him charging excessive. I have to calm him down! He keep on raising his voice on us for a minute. I did not choose to quarrel with him as I do not want to show bad example to my daughter. His chicken rice is okay but the very poor service and attitude toward customer make us stop visiting to Kong Heng again. Other stalls in the restaurant services are good by Malaysia standard. The chicken rice stall leaves a very bad name to Kong Heng restaurant Ipoh. I do not think I am the first customer to get bad experience from him. I advise future customer not to question or argue with him in order to have peaceful meal. The restaurant’s employees are utter rude especially the guy that is incharge of handling customer’s sitting place. He acts like he is a big shot and kept pushing us to order the chicken rice. When we question him about the price, he raised his voice and arms like no one should question about the pricing and our visit here is to eat. Trust me the food is not that good and the worst part was no meat was given, just the wings.